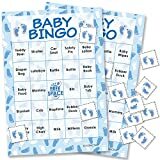 Includes: 24 Blue Baby Shower Bingo Game Cards, 378 Bingo Card Chips, 36 Drawing Chips, Game Instructions. Reusable Baby Shower Game; Up to 24 Guests; Purchasing Multiple Games Will Create Multiple Winners. PROFESSIONALLY PRINTED on premium cardstock: 5" x 7" player cards. EASILY CUT along dotted lines of chip sheets. NOT for full-cover bingo. It's a Boy Baby Bingo Game Features White and Blue Footprint Pattern Designs for Boy Baby Showers. 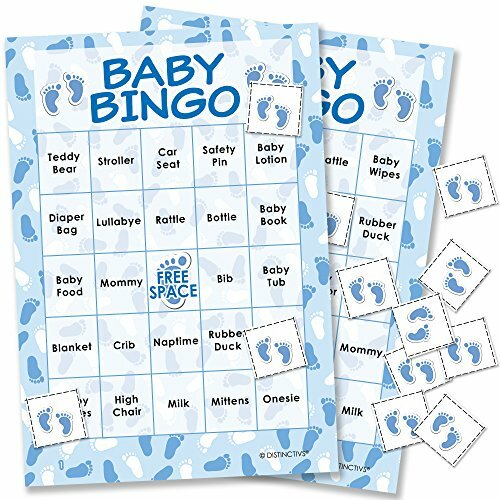 This Blue Boy Baby Bingo Set is the Perfect Baby Shower Game for your Its a Boy Baby Shower Party.